Bookends: Mail-Order Groom by Cindy Flores Martinez ~ Book Excerpt! Mail-Order Groom by Cindy Flores Martinez ~ Book Excerpt! 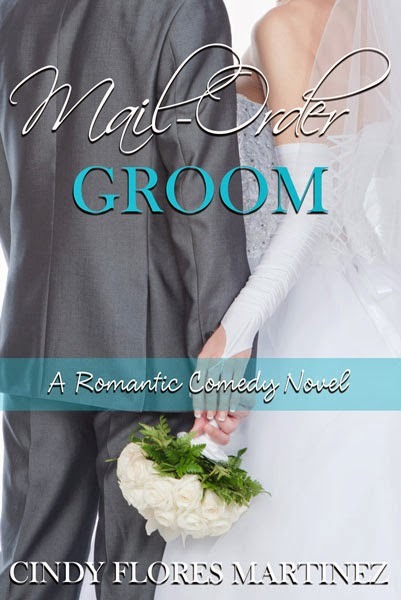 Mail-Order Groom, a debut romantic comedy novel by Cindy Flores Martinez, was inspired by the author’s own Polish ancestry and is based on her screenplay and movie project of the same title, which she shopped around Hollywood, New York, and other parts of the world. A story about an American woman who marries a stranger from Poland after her fiancé leaves her right before the wedding. At 25, Lisa is about to marry her first real love and have the wedding of her dreams, but her world is shattered when she finds her fiancé, Jeff, in the arms of another woman. When he calls the wedding off, Lisa is heartbroken, but her heartache turns to anger when she sees him in town the next day with the other woman. In a momentary lapse of reason, Lisa decides to marry another man at the wedding. She finds Krzysztof Zielinski from Poland on Mail-Order-Grooms.Com. He needs to marry an American woman so that he can stay in America, and he’s willing to pay money for it, but his reason for needing to stay is what tugs at Lisa’s heart and convinces her to say “I do” to him. Besides, green card marriages are easy, right? They’re short-lived and not real. She won’t even have to live with him. And marrying another man would be the perfect revenge on Jeff. How will she handle the dilemma she has gotten herself into? I grabbed the sofa pillow, which was beside me, and dragged it onto my lap to embrace it for comfort. Krzys’s journal fell out from behind it. He had hidden it there and had forgotten it. I set the pillow aside, reached for it, and opened it to page one. Today I saw the most beautiful woman I have ever seen. She walked into the bookstore when I was there. She smiled at me and I felt as if I couldn’t breathe. I felt like I had met her before in a dream. Here is a poem I wrote for her. The sun shines lightly all around beautiful you. I have known nothing better, beautiful you. It’s here for no one else, beautiful you. My hand trembled as I turned the page and continued reading. I saw her again today at the bookstore, the woman I’m in love with. I heard April call her name. I haven’t been able to get it out of my mind. Her name is Lisa. Lisa? Was he talking about me? It didn’t seem possible. I couldn’t be the only Lisa that went to the bookstore. As I read on, I recognized the encounters he described, and I knew I was the one he had written about. He said he always listened to me talking with April and everyone who was at the bookstore, and he fell in love with the person I was. He wanted to talk to me too, but he noticed an engagement ring on my finger, so he kept his distance. He said he was shocked and confused when Jerzy and Magda told him that they had found a bride for him and that she was me. He couldn’t understand how it had happened. He had planned to return to Poland, but he stayed because he wanted to be with me. He described the joy he felt at our wedding, the first time he felt my touch, the warmth and softness of my skin, the wonderful scent of my hair, and the first time we kissed. He was deeply moved when I told him not to give up on his writing. No one had ever cared enough to say those words to him before. He wrote a poem for me that night. And I forgot what heartache meant and what lonely days were. I could barely see his words through my tears. He said he read the letters and love notes that I had written to Jeff, which he gave back to me in the plastic storage container. They, more than anything, had touched Krzys’s heart. He wished that I would say words like those to him. He had always wanted the kind of love that I could give. He longed so much to tell me that he loved me, but he didn’t have the courage. He hoped that someday he would. I wiped my tears and searched the remaining pages. I found a last poem in English, which he said was for me. It was dated that day. Than to see you and feel you and hold you like before. I closed the journal and rose to my feet. Krzys still loved me. It wasn’t over between us. I had to go and find him. I had to tell him that I loved him too. Thank you for featuring my novel Mail-Order Groom on your website. I hope everyone will enjoy reading it as much as I enjoyed writing it.